Bi-directional ribbon microphone provides premier, symmetrical audio with off-axis rejection and consists of a suspension shock mount and a case. A side address microphone accepts sound from an angle perpendicular to the mic as opposed to a end-address mic where you speak into the “end” of the microphone. A microphone with a Figure of Eight polar pattern picks up the sound from in front of the microphone and from the rear, but not the side (at a 90 degree angle). Microphones with this Figure of Eight polar pattern are typically rIbbon or Large Diaphragm Microphones. A ribbon is the component in that special type of dynamic microphone that captures the sound. It is usually a piece of very thin electricity-conducting foil. It is suspended between the two poles of a powerful magnetic assembly; one end grounded to the pole pieces, the other end insulated. This design enables a signal voltage to be formed as the foil vibrates within the dense magnetic field. Ribbon microphones are known for their ability to capture high frequencies in great detail. They are typically bidirectional. A microphone with tailored frequency response is usually designed to enhance a sound source in a particular application. For instance, a microphone may have a peak in the 2 – 8 kHz range to increase intelligibility for live vocals. 3 Pin XLR: The circular 3-pin XLR connector is an industry standard for balanced audio signals. Bi-directional ribbon microphone provides premier, symmetrical audio with off-axis rejection and consists of a shock mount and a case. It features increased durability and a dual-sided transformer to minimize signal loss and stop RF interference. What is the KSM353/ED best suited to? 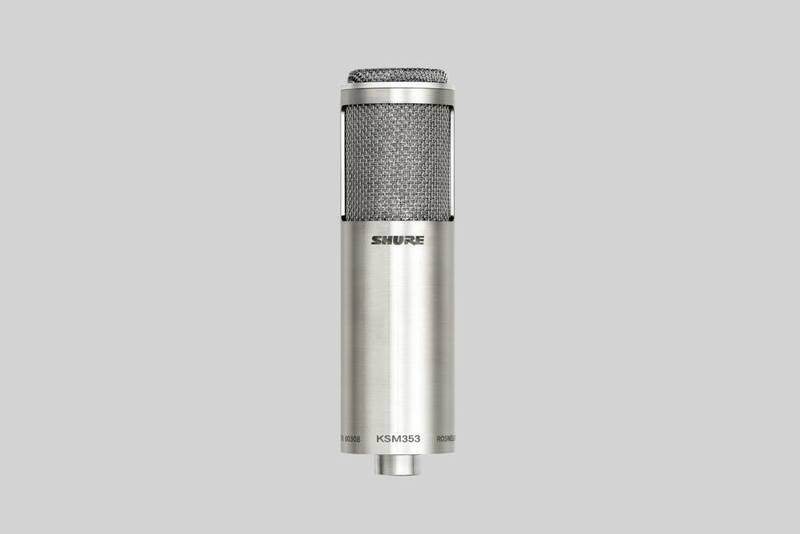 The KSM353 is best suited to intimate vocal applications. How is the KSM353/ED different to other ribbon microphones? Ribbon microphones are renowned for being extremely delicate. The KSM353’s high-tensile strength, toughness and shape memory of Roswellite™ ribbon material replaces traditional foil ribbons for superior resilience at extreme SPLs and allows the microphone to be more durable.